The price of gas continued its consistent, summer-long decline during the past week, according to the latest fuel price survey from the U.S. Energy Information Administration. The national average cost of gas dropped to an eight-month low last week, with regular unleaded settling in at $3.45 per gallon. The last time prices were this low was during the survey period of February 24, 2014, when a gallon of regular unleaded was at $3.44. Prices have fallen significantly since the start of July, when the cost of gas was $3.70 nationally, and much higher in some survey regions, including the West Coast. The price of fuel began dropping in May, although it reversed course through most of June, greeting drivers with elevated gas prices just as the summer driving season gained momentum. A peculiar combination recent events has helped push the price of gasoline down, but only in the past few weeks. Until the start of July, consumers had faced a near-relentless spate of weekly price increases. However, new U.S. crude oil output, crude stock supply data and a tempered outlook regarding geopolitical risks have all taken their toll on wholesale gas and crude oil in recent weeks. West Texas Intermediate, the domestic crude futures index, traded $105 per barrel at the end of June, only to begin a decline through July, ending the month in a dramatic selloff. Prices have continued to fall through August, and WTI is now trading under $94 per barrel. The strange juxtaposition of influences has resulted in good news for drivers, who were supposed to enjoy gas prices in the $3.50 range through most of the summer. The E.I.A. had forecast that price point as recently as the beginning of 2014, but it quickly became apparent, by the end of February, that the price of gasoline was not going to remain reasonably low through the year. The end of February was the last time prices were as low as they are currently. The range of gas prices from one region to another is quite dramatic. Once again, the cheap spot for gas is the Gulf Coast region, where prices are down to $3.24 per gallon for regular unleaded. The West Coast, the dubious leader in the gas price survey, was presenting drivers with gas costing $3.83 per gallon. The Midwest, consistently an inconsistent region where gas prices are concerned, had prices that barely moved or were just higher during the past week. 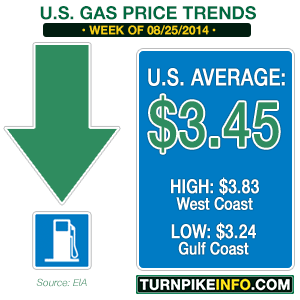 The regional average remained at $3.40 per gallon this week. Prices on the East Coast ranged from $3.54 in the New England States to $3.32 in the Lower Atlantic states.